Living Reflections (from a dream): The Man, the Legend....the TRIBUTE! The Man, the Legend....the TRIBUTE! 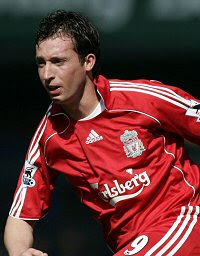 Fowler's career began with Liverpool, with whom he made his debut in 1993. Fowler scored 120 premiership goals for Liverpool in an eight year period. He subsequently played for Leeds United and Manchester City F.C., before returning to Liverpool in January 2006. As of May 2006, Fowler is the fourth highest goalscorer in Premier League history, behind Thierry Henry, Andy Cole and Alan Shearer. Scoring first-team debut in Liverpool's 3–1 win in a first round Coca Cola Cup tie at Fulham on 22 September 1993. Scored all five goals in the second leg at Anfield two weeks later – the fourth player in Liverpool's history to score five in a senior fixture. First league hat-trick against Southampton in only his fifth league game. His first thirteen games for the club yielded twelve goals, and he finished his first season at Liverpool as the club's leading scorer with eighteen goals in all competitions. Scored a hat-trick in four minutes and thirty-three seconds against Arsenal, a Premiership record. Voted PFA Young Player of the Year in two consecutive years (1995 & 1996), a feat equalled only by Ryan Giggs and Wayne Rooney. Throughout the mid and late 1990s, Fowler was widely considered to be the most natural finisher playing in England. Scored more than thirty goals for three consecutive seasons, up to 1997. Scored twice in a 4-3 victory over Newcastle, a match considered the best of the decade. On December 14th 1996, he scored four against Middlesbrough F.C., the second of which reached a century of goals one game quicker than his mentor, Ian Rush. In 1997, after scoring a goal in a Cup Winners' Cup game, he lifted his Liverpool shirt to reveal a T-shirt supporting sacked Liverpool dockers for which he picked up a fine, but greatly increased his popularity on Merseyside. 1997 – won a UEFA Fair Play award for admitting that he had not been fouled by David Seaman at Highbury after a penalty had been given. After unsuccessfully trying to convince the referee to change his decision about the penalty Fowler took it tamely and Seaman saved, the ball rebounded however and Jason McAteer tucked it home. 2000-01 Season – Robbie’s most successful season, appearing in three finals scoring 17 goals, and lifting three trophies in a unique Cup Treble – League Cup (where he got the Alan Hardaker Man of the Match award), FA Cup, and the UEFA Cup. 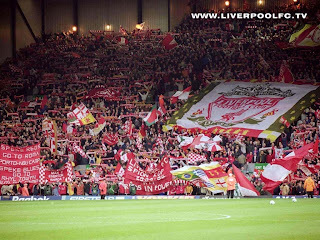 Liverpool’s final game of the 2000-2001 season was against Charlton in which Fowler scored twice in a 4-0 victory that assured them Champions League qualification for next season. In October 2001, he scored his first league hat-trick for three years, helping Liverpool beat Leicester City 4–1, but was dropped for the following league game. His last appearance was against Sunderland when he was substituted at half-time. Despite his popularity with Liverpool fans, a combination of off-field controversy, disputes with Gérard Houllier and training ground arguments with then Assistant Manager Phil Thompson, led to Fowler's departure to Leeds United F.C. In total he scored 15 goals in 31 appearances for Leeds; a goal every two games. In the 2002-03 season, Fowler was transferred to Manchester City following a protracted transfer saga. Fowler ended the 2004-5 season as the club's joint top goal scorer, and gained the approval of the fans, finishing in the top three in the fans' Player of the Year poll. In January 2006 he scored Manchester City's third goal in their 3–1 win against local rivals Manchester United F.C. after coming on as substitute. After scoring, he ran to the United supporters, holding up five fingers (Liverpool's five European Cup wins vs United's two). Fowler made only one more appearance for Manchester City before returning to Liverpool. 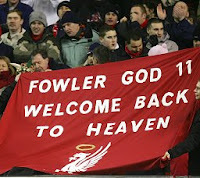 In 27 January 2006, Fowler rejoined Liverpool from Manchester City. Fowler was in the Istanbul crowd when Liverpool won the Champions League in 2005. Fowler's return against Birmingham City F.C. in February 2006 was labelled by the press as the stuff of fairytales, and he came on to a rapturous reception in his first appearance for Liverpool in four years. He had three goals ruled out for offside, before finally scoring on 15 March 2006 in a home game against Fulham, who he scored his first goal against on his Liverpool début 13 years earlier. Fowler's next Liverpool goal meant he overtook Kenny Dalglish in the club's all time top scorers. Fowler finished the 2005-6 season scoring on a more consistent basis than Liverpool's other strikers. On 24 February 2007 he scored 2 penalties against Sheffield United - his first in front of the Kop since his return to Liverpool. In his last game at Anfield for the club against Charlton Athletic FC on the 13th May 2007, Fowler was given the captain's armband one final time. He was substituted minutes from the final whistle and given a standing ovation. Harry Kewell scored an equalising penalty to tie the match 2-2 for Liverpool in the 90th minute. Had Fowler not been substituted, he would have taken the penalty. Regardless, the crowd still chanted his name as match finished and applauded him for his years of service. Saucer of milk, table eight (aid)?